 Use your freshly learned skills and apply them in real-world conditions. There are a handful of decent training opportunities out there for introducing you to the world of adventure motorcycle touring. A weekend of coaching will certainly be of benefit. But if you really want the training to become planted, you must apply those newly learned skills. Combining training with a tour is the answer – and you will marvel at the results. The Moab Adventure Training is designed for ANY LEVEL OF RIDER who has the desire to travel beyond the pavement and wishes to improve the important fundamentals required to ride in a variety of off-road conditions. Because this is a small-group training, all levels of riders are welcome to attend and will gain valuable skills regardless of off-road experience. The nature of this event demands a dual-sport, street-legal motorcycle equipped with proper tires. This event is well suited for dual-sport motorcycles in the 250-650 CC range. You should already know how to ride and have substantial pavement riding experience. This event is limited to 8 riders. The ride consists of both paved and off-pavement roads of varying degrees of technicality and has several options that can be adjusted to meet the personal level of challenge desired. Training is brought to you by D.A.R.T. and is personalized to the level of each rider. Bill Dragoo is a BMW Certified Instructor (all brands of motorcycles welcome). Even experienced riders who have developed less-than-perfect riding habits can benefit. And because the groups are small, you can count on getting one-on-one low-pressure coaching allowing you to progress at your own pace. 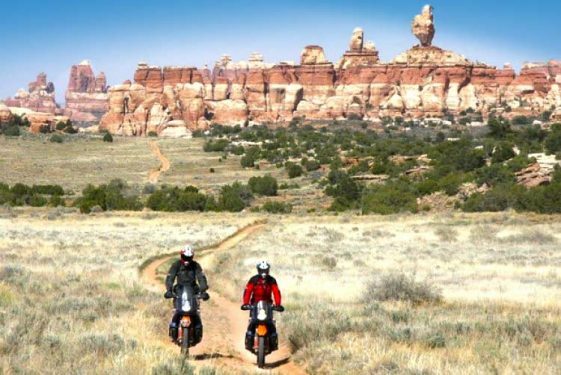 If you think this Moab Adventure Training is all about the classroom, you’ll think differently as you ride the wondrous Canyonlands and with each day feel your confidence build and your enjoyment soar. You will gradually ride more relaxed, becoming one with your motorcycle as we train every day of the event in different environments. What was once white-knuckle will gradually transition to exhilarating, confident touring. That is MotoDiscovery’s goal.